As a landscape architect, I am always amused and interested to discover the spark that awakens an individual’s connection to nature. Sometimes it’s a whim, a serendipitous meeting. Sometimes, it’s travel, a visit to a garden – in person or via the pages of a magazine. Sometimes, after years and years of planning, it’s a determination to seize the moment, act on a dream. For a recent client of ours, the spark was a story in the Houston Chronicle. 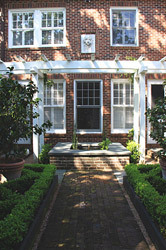 In December of 2005, Kathy Huber, garden editor for the paper and one of the city’s favorite writers of all things green, wrote about one of our projects for a neo-European garden in Galveston. Through Kathy’s descriptions and the accompanying photos, the reader, a Houstonian transplanted from the Deep South, felt a connection to gardens she loved in Charleston, South Carolina. The lattice, the paving patterns, the boxwood plantings resonated with her. And so she called. As a working relationship became a friendship, she confided that she had never truly felt connected to her Houston home. An accomplished gardener in her own right and owner of an envious library of gardening books, she had created a home that was decidedly comfortable and more than pleasing, but she was seeking something more. And so we began. Planning and scheming, challenging each other to be our best. We started small, adding components of the gardens, one on the other, enriching and restoring the comfort and sense of home. In the end, the connection was made. As the garden evolved, the house became home, inside and out. Her husband agreed, and in one of the best compliments I could ever receive, remarked that the garden was his place to unwind, a restorative niche. The sounds of the fountain, the fragrances, the birds all helped him reconnect and find a new source of energy and inspiration, releasing worry and stress. Photographer: Gaile Porter. Here, you will find images of their garden and you can discover how this couple connected with nature and completed their vision of home. Take your time. Reconnect. I myself smile inwardly, looking at the pictures and remembering the journey we enjoyed as we sparked the connection.